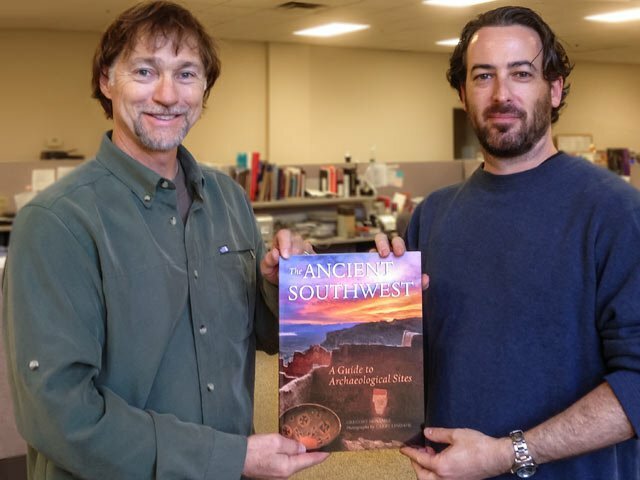 My new book “Ancient Southwest: A Guide to Archaeological Sites”, with more than 130 photographs, has just been released by Rio Nuevo Publishers (Tucson, Arizona). A hearty thank you to editor Aaron Downey, pictured here, and to publisher Ross Humphreys for accepting the original proposal for this book. The book takes you on a photographic tour of ancient archaeological sites in fifty national parks, national monuments, state parks and other cherished sites in the American Southwest. Through the colorful images you’ll go far back in time, to the era when the ancient people built remarkable cliff dwellings and created intricate rock art in the area now known as the Four Corners states of Utah, Colorado, New Mexico, and Arizona. From a personal quest that has lasted nearly 20 years, I photographed not only the well-known sites such as Mesa Verde, Canyon de Chelly, and Chaco Canyon, but also traveled to lesser-known sites such as Sego Canyon, House of Fire, and one of my favorites, the mysterious Hovenweep. There are a variety of challenges in bringing this collection of images together. Over the span of the project I treasure the opportunities to work with pilots on aerial photography, go with Native American guides to hidden ruins, participate in once-a-year events, use route-finding skills to find remote sites, and travel with friends. The book design is by the very talented David Jenney, a friend and colleague. This is a dream project come true!